Claims that atomic power reactors are the solution to global warming are simply attempted rebranding efforts by the nuclear power industry to make people believe nuclear power is a “clean” way of generating electricity. 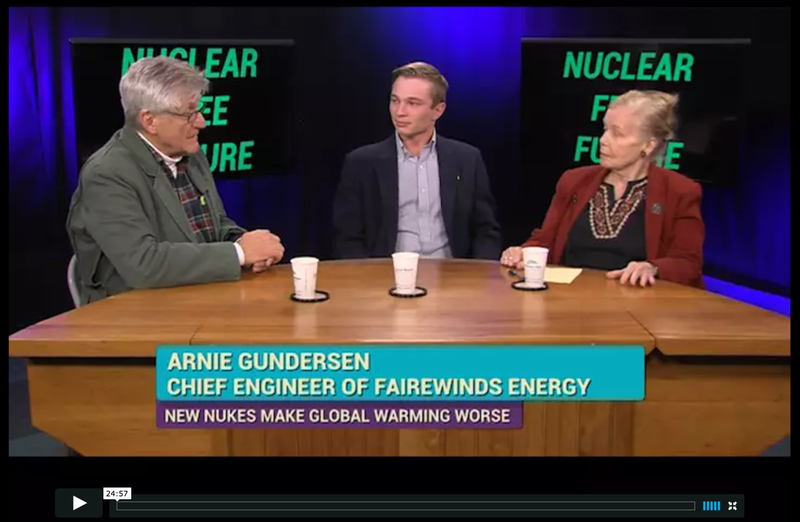 Listen to CCTV host Margaret Harrington of Nuclear Free Future interview Fairewinds Chief Engineer Arnie Gundersen and Research Assistant Grayson Webb to discuss how the atomic power industry tries to sell the world its false narrative that it helps reduce Global CO2. In this interview, Arnie and Grayson discuss Fairewinds 18-month research endeavor that found using atomic reactors would reduce CO2 emissions only 6% by the year 2050 and cost more than $8.2 Trillion! Renewable and sustainable energy sources are much cheaper and will also boost the US economy as it creates real jobs in America. MH: Welcome viewers to our ongoing Nuclear Free Future conversation here from the Center for Media & Democracy in Burlington, Vermont. I’m your host, Margaret Harrington. And viewers, let’s welcome our special guest to my right is Grayson Webb from Fairewinds Energy Education. Welcome, Grayson. Thank you for coming. And welcome back, Arnie Gundersen, Chief Engineer from Fairewinds Energy Education. Happy Holidays. It’s hard to believe we’re at the end of 2016, one of the longest years in history. Almost over. But we’re beginning also a new push for putting – first of all, the title of our program is Nuclear Power Makes Global Warming Worse. And what I was going to say, Grayson, is that we’re at the beginning of a new push to make nuclear power the alternative to the global warming. And this you both claim is wrong and saying that the nuclear solution to climate change is a smoke screen. So can you start off with what you mean by that – this smoke screen?